Summer Sounds is a music festival for children ages 3-11 at the historic Hollywood Bowl featuring daily concerts designed for kids and an outdoor fine arts studio. Concerts feature music from different parts of the world depending on the week. Shows often sell out in advance so book early. Where: The Hollywood Bowl, 2301 N.
Cost: Performance and workshop $16 ages 2 and up; Discount for multiple workshops. Top children's musicians, entertainers and interactive theater in the outdoor terraced amphitheatre at Theatricum Botanicum in the Topanga Woods in Topanga Canyon. It's bench seating, so you might want to bring cushions. The Ford Amphitheatre presents Big! World! Fun! family shows in an outdoor amphitheatre. Food and beverages available for purchase. Cost: $5 for Adults, FREE for kids; reservations required. An intimate educational setting for children ages 6-9, consisting of a performance, a brief history lesson on the musical and cultural style being presented, followed by a question-and-answer session with the performers. Tickets are free, but advance reservations required. The Levitt Pavilion in Pasadena hosts Children's Music artists and other family entertainers on Thursday evenings in July and August. Most of their other summer concerts are also family-friendly. Parking: The closest parking garage is located on Raymond Ave., across the street from the band shell. Also, there are 300 metered spaces on Raymond Ave. The Levitt Pavilion at MacArthur Park in Los Angeles hosts children's music artists a on Sunday evenings from late June through August. There is a pay lot 611 S. Carondelet Street, located between W. 6th Street & Wilshire Blvd. 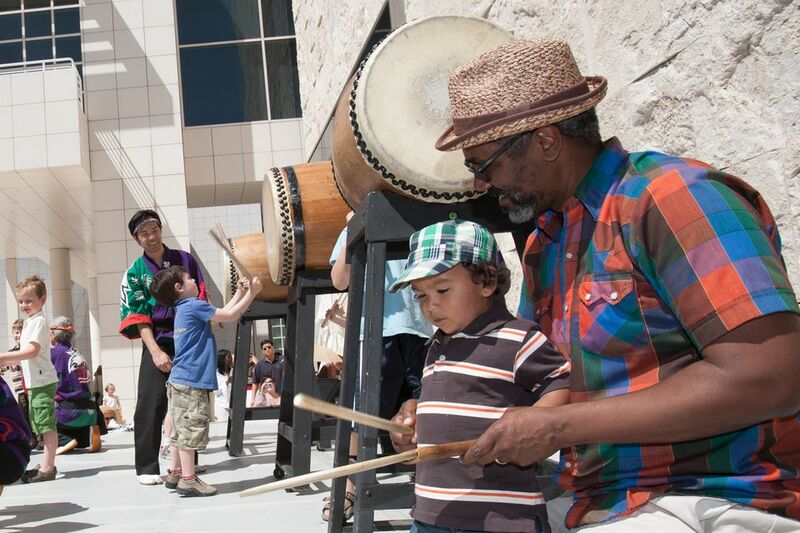 The Getty Center in Brentwood brings top children's performers from around the country to their garden on some weekends in August. They also have periodic family festivals in the courtyard. Dozens of activities are scheduled in July and August at beach areas throughout Long Beach, including the Chinese Dragon Boat Race and the Great Sand Sculpture event. There are aquatics-oriented events for the entire family! Find discounts on family entertainment at Goldstar.com. This information was accurate at the time of publication. Please check with venues for the most current information.